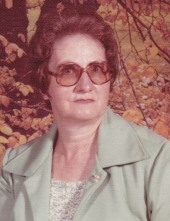 VERA M. HAILAR, age 89 of Tabor, IA, died Tuesday, February 5, 2019 at Tabor Manor Care Center in Tabor following a brief illness. Vera was born July 8, 1929 in Holt County, Missouri to William Edgar Cooksey and Elsie May (Proffit) Cooksey. She was married to Frederick Lewis Hailar on July 18, 1947 in Council Bluffs, Iowa. She owned and operated a restaurant in Tabor several years ago. Vera was preceded in death by her parents; nine siblings; husband, Frederick Hailar; 2 daughters, Doris (Jeane) Hailar and Dawn Hailar; and a son, Dennis Hailar. She is survived by her daughter, Teri Spraggins and husband John of Carson City, NV; 2 sons, Frederick Hailar and David Hailar both of Golden Valley, Arizona. She is survived by eight grandchildren, several great grandchildren and nine great-great-grandchildren; several nieces and nephews; cousins, other family and friends. Graveside services will be 2:00 PM Monday, February 11, 2019 at the Tabor, IA Cemetery with Rev. Jan Phillips of the Tabor United Methodist Church officiating. Visitations will be with the family greeting friends from 12:30 to 1:30 PM Monday at the Crawford-Marshall Funeral Chapel in Tabor, IA. Memorials will go to Tabor Manor Care Center. The Crawford-Marshall Funeral Chapel in Tabor, IA is in charge of arrangements. To plant a tree in memory of Vera Hailar, please visit our Tribute Store. "Email Address" would like to share the life celebration of Vera Hailar. Click on the "link" to go to share a favorite memory or leave a condolence message for the family.